Riot Games has released a preview of the next Champion to join League of Legends. Thresh the Chain Warden is a support character with the potential to wreak havoc on the battlefield. Thresh can severely hinder the movement of the other team. His Death Sentence ability allows him to pull enemies toward him. He can also knock them out by casting Flay. A spell called The Box will create walls slow and hurt and enemies that pass through it. This champion can also protect his allies. His Dark Passage spell throws a lantern at a targeted location and shields nearby allies. If those allies are in trouble, they can click the lantern and be pulled to Thresh. While all of these abilities seem handy in their own right, they become really interesting when combined. For example, Thresh can use Thresh to pull enemies into The Box. Or he can use Death Sentence and Flay together to knock an opponent in the air and then pull them in for a finishing blow. 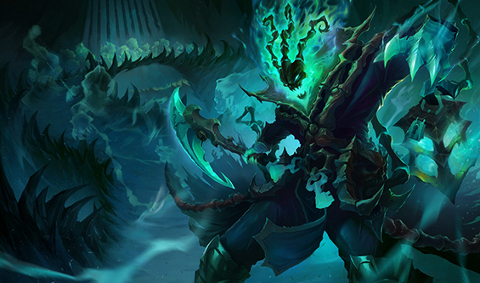 The first artwork of Thresh is below. Expect a spotlight video soon.